All inclusive luxury holiday package with rather generous additions. All meals + one night free. 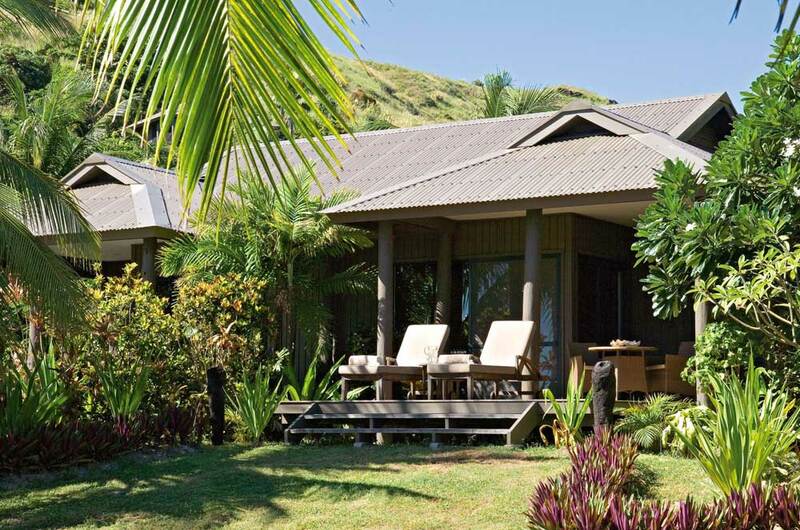 The quintessential luxury Fiji resort. Off the mainland and therefore very private. 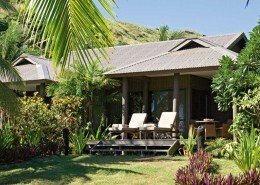 High end resort facilities and services yet still with that familiar Fijian friendliness guests expect in Fiji. 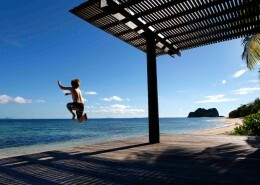 A stand out on VOMO would have to be The Residences – luxury holiday beach houses accommodating larger family groups. Love! These luxury homes are like something out of a world architecture magazine. So beautifully designed and furnished. 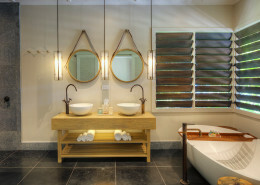 The standard accommodation is their Hillside Villas – definitely “high” standard. My personal preference is to stay here be it just for the views. But if you want to take your VOMO experience to the next level then the beachfront villas and havens are a great holiday indulgence. 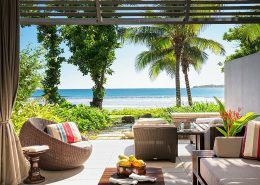 Walk into stunning beach and ocean surrounds directly from your villa. Just a little bit special! Being a large island, it’s easy to find solitude here. 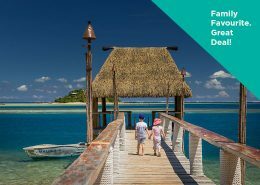 5 night Fiji holiday package deal @ Vomo Island, Fiji. Absolute Luxury. All inclusive luxury holiday package with rather generous additions – All meals + up to 2 nights free (when staying 7+). Pure beachfront bliss. 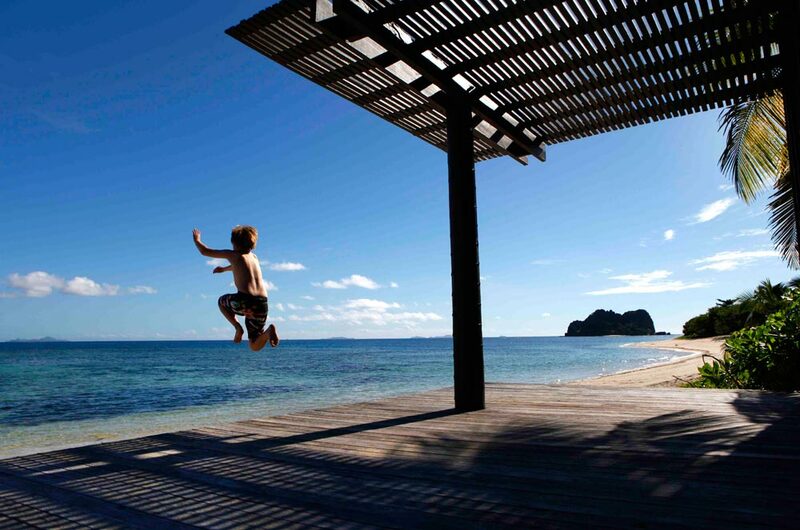 Vomo Island Fiji is a luxury boutique resort fringed by white sand beaches & clear blue water. Located on a privately owned island, Vomo Island boasts premium cuisine, luxurious villas & an experience that’s entirely your own. Spend your time relaxing with a cocktail in hand or keeping active with one of the many activities on offer. As the most up market boutique resort in the Mamanuca group that welcomes children year round, it features a purpose built Kids Village Club House and interconnecting villas to guarantee family comfort, as well as incredibly decadent 3 and 4 bedroom villas with their own pools ideally suited to larger families, small family groups or friends travelling together. Food is an important part of any holiday, and on Vomo it is given enormous attention. The result is a standard of cuisine normally found in fine restaurants, made from the freshest ingredients, and very contented and delighted guests. 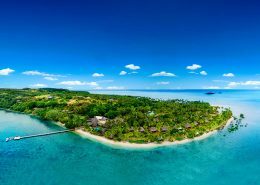 Conveniently located only 12 minutes by air from Nadi Airport, it features a 9 hole par 3 golf course, flood lit tennis court, well equipped gym, Spa and a myriad of water sports to keep the most active guests of all ages entertained. Vomo is a truly beautiful resort and has a relaxed atmosphere that ideally you could bottle and take home with you. We have stayed at Vomo 3 times. It has always delivered the ultimate break from our hectic lives. The rooms have been newly refurbished and are gorgeous. The food is outstanding and a treat every time. Our last night was dinner for 4, waiter serviced, on the beach; a truly unique experience. From an early morning start at home in Christchurch New Zealand, we were on the beach at 2pm…….fantatstic. the heli transfer is 12 minutes. Cost bit more, but max the time on the beach. ‘The Rocks’ restaurant is almost finished and will provide a stunning alternative to the main dining area by the pool. Would we recommend Vomo to others? Totally. The whole resort has blistering fast wfi inside and out…….is brilliant. One extra night for free !!! The Kids Village @ VOMO is a purpose built, air-conditioned, child care facility with large indoor and outdoor play areas. Care is provided on complimentary basis for all children aged 4 – 12 years. *Terms & conditions apply: Valid for travel 01 – 13 April 2019, 28 April – 22 June 2019, 20 July – 28 September 2019, 13 October – 21 December 2019 & 12 January – 31 March 2020. High season surcharges apply. Sale to 30 April 2019. Minimum 5 night stay applies. Pre & post accommodation may be required due to flight times (extra costs apply). Price per adult, twin share based on Fiji Airways sale fare. Prices shown are a guide only, based on low season, availability & subject to change without notice. Other conditions may apply.